I recently gave my client a makeover for a professional speaking event. She was speaking to a group of young girls, to give them guidance and encouragement at their school. We wanted a light, professional makeover. This is a great look for work or school. Check it out! 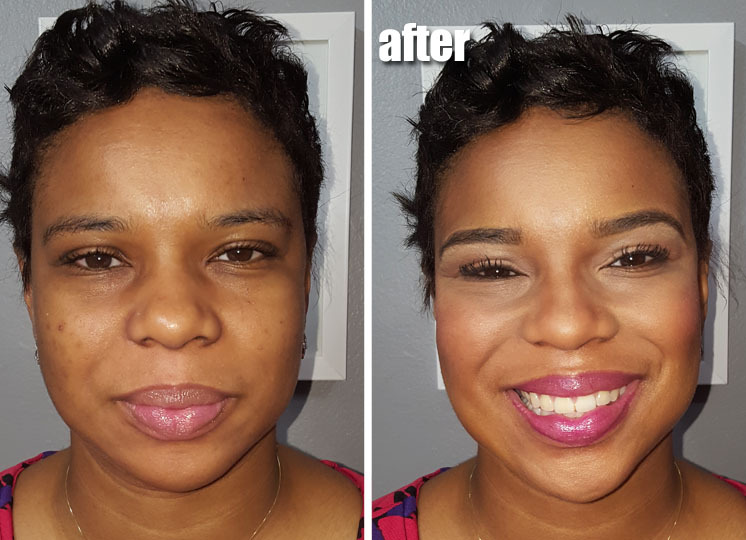 The key to this look is brightening and perfecting her skin. She has darkness under her eyes which only developed in recent years. I used my holy grail Eve Pearl Salmon Concealer, a mix of tan and dark to cancel out the darkness. Then I used my Graftobian Warm Cream Foundation palette to apply foundation, highlight and contour. A bit of berry blush then brings back color to the cheeks. I also cleaned up her brows and did very light eyeshadow. A few coats of mascara on her awesome lashes and a berry colored lipgloss nicely complimented her outfit. Hope you enjoyed this quick makeover. Ciao Bellas!